Digital Surrogates from the President Edmund J. James Subject Files, includes the digitized report "Report of Special Senate Committee" presented to the University Senate on June 9th 1975, concerning President James' proposal of creating a constitution for the University of Illinois. 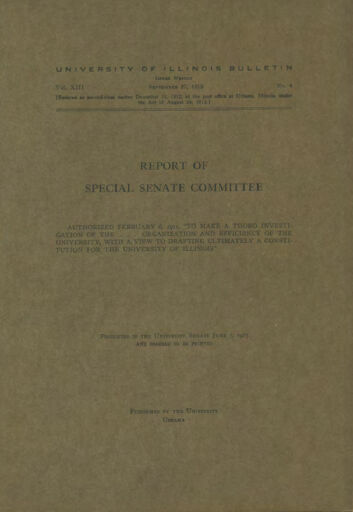 The original report can be found in this series (RS 2/5/5), at Box 8. The President Edmund J. James Subject Files (Digital Surrogates), 1975 are managed by the University of Illinois Archives and do not feature precise descriptive information for each item. Discover their contents by browsing the folders and files. For more information, contact an archivist at illiarch@illinois.edu.